2012 Charter Season has started! Hurrah!!! 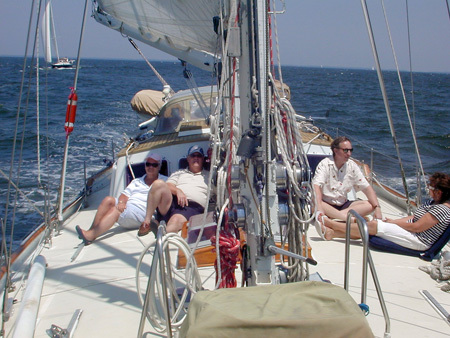 Welcome to the 2012 season for Schooner Heron Charters, offering custom daysails on the Chesapeake Bay aboard the beautiful staysail schooner, Heron. 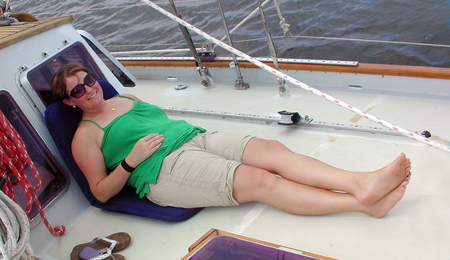 $390 for up to six people gets you out on the Chesapeake Bay for 5 hours, and lunch is included. Help to sail the boat, or sit back and relax. Your choice. 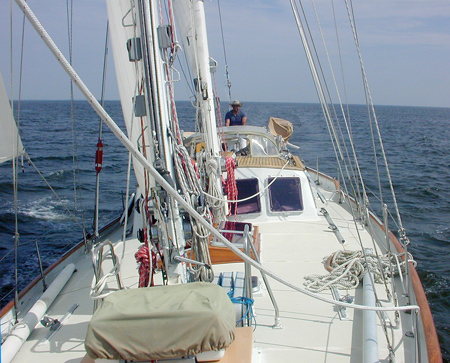 Sailing out of Solomons Island, Maryland, a quick 50 minute drive from the Beltway, Schooner Heron Charters is easy to get to and a great way to enhance your Southern Maryland getaway. 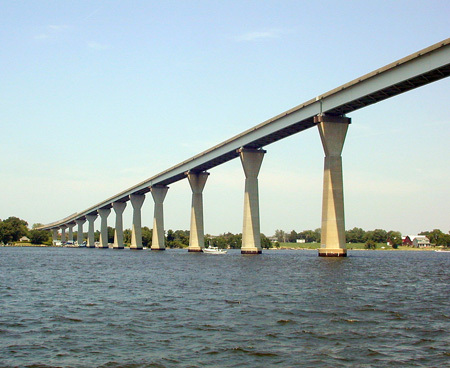 To learn more about the special and wonderful activities planned in Southern Maryland and Solomons Island, please visit the website for the Solomons Business Association. Welcome to spring and summer! And come on down for an afternoon sail! June 20. A dignified (and fun) Anniversary Surprise! Sometimes you sense the presence of dignity in a person, and that’s what I felt when I met Mohammad. There was just something quiet and strong about the man. But, I’m ahead of myself a little bit. Cindy booked the charter as a surprise for her husband to celebrate their 22nd wedding anniversary, and a surprise it was! The rest of the family: son Chaz, daughter Layla, and her fiance, Zach, were all in on it. But, Mohammad was clueless as to what was going on. They showed up at my house dressed like they were going to a 5-star restaurant for lunch. I came out to meet them. “You’re going sailing dressed like that?” Mohammad said, “Oh, we’re going sailing?” It was great. 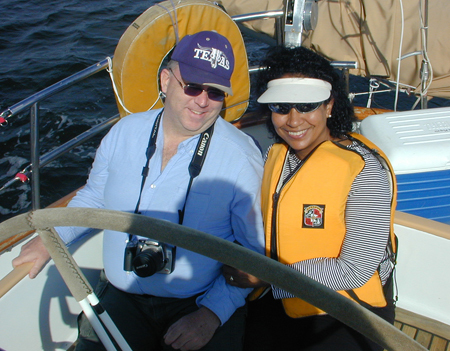 They came into the house, met my Zach (my 30-year old African Grey parrot), changed their clothes… and we were off to go sailing. 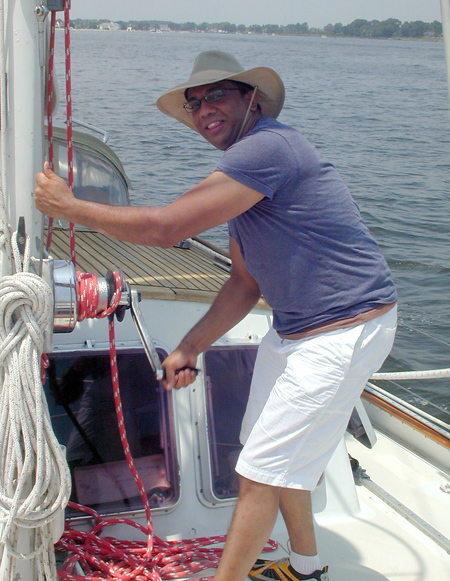 On my schooner, Heron, I can promise you when you make the drive down to Calvert County and Solomons Island to go out for a sail, I’ll do everything I can to make your charter day as good as it can be. But, I can’t control the weather. I can’t make the sailing more or less exciting or peaceful. 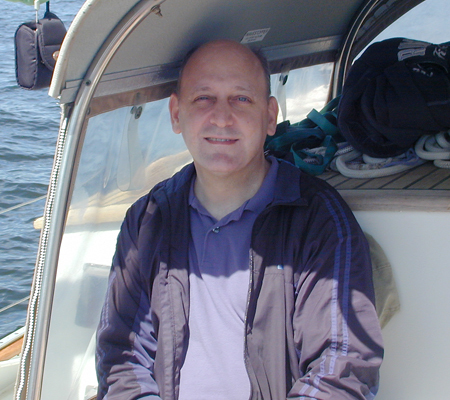 This particular day was a “variable” day, as they say… some wind… some movement of the boat… But, not terribly exciting. But, still, the sails had to go up, and as usual, I found a hearty soul willing to do the work. Chaz is a computer guy, still in school, but is also apparently quite the musician, piano being his specialty, and he also wants to make music be a big part of his life. I’m sorry I didn’t get a chance to hear him play on one of my keyboards. I suppose on boats worldwide, people do the “Titanic shot” and yet, this one, with Zach and Layla up forward, on such a pretty day, seemed especially poignant. THAT is a beautiful photograph, and THAT was a beautiful moment. Now, I mentioned that I felt a tremendous sense of dignity in Mohammad. But, even dignified people can get warm on a hot Chesapeake Bay day. So, he cooled down with a fresh water spritz from my wash-down hose. This is primarily used to wash down the anchor chain before it is stored below, as you pull up the anchor from a muddy bottom. But, on hot days, the spritz of fresh water from my tanks is just what is needed to feel cooler and refreshed. In most of my blog articles, I’ve used the expression, “Once again…” and this will be no different. Once again, this turned out to be a great family day, a way for a very close family to spend time together talking, laughing, sleeping, especially to celebrate 22 years of marriage. And once again, I felt honored to be able to share in this intimate time with a really nice group of people. What can I say? These ladies were a great fun time! You’re notice the husbands, Fermin and Miguel smiling in every shot. 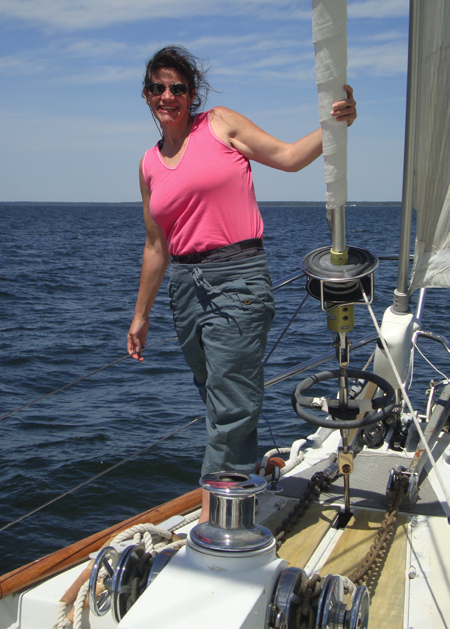 Our charter offering to take folks sailing on the Chesapeake Bay keeps bringing the coolest and nicest people down to Southern Maryland and Solomons Island. These two families, husband Fermin, wife Kirstie and son Elias, and husband Miguel, wife Stacy, and daughter Naiya are great friends, and they let me share in a bit of that friendship on the day we went out for a sail on Schooner Heron, looking for wind. Then, it was Naiya’s turn, with the help of father Miguel. What great conversation we had all day, learning all about what we each did in our lives, what we had done, what we hoped to still do. Fermin is a chiropractor, and director of VA Family Chiropractic Health Center. He gave me some good tips during the day, about my health, and I’m still waiting for the bill to arrive in the mail. 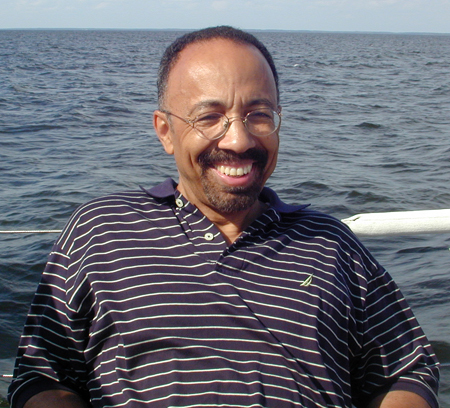 Stacy is a writer and Director of Legislative Grassroots for The National Treasury Employees Union, representing federal employees from many agencies. She has since sent me some contacts of literary agencies for my novel… a book which was almost published nine years ago, but which had to be shelved and became an “economic ripple” (because of its storyline) after the 9/11 attack on the World Trade Center. I really appreciate her help with that. Miguel is an engineer for a major hotel chain, in charge of a huge staff which keeps EVERYTHING running right for their customers. And Kirstie, if I remember correctly, is a stay-at-home Mom… the hardest of all the jobs! 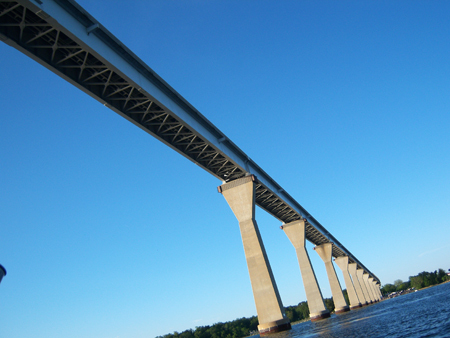 The wind came up and it was a bit choppy out in the Bay, so we took advantage of the SW wind and came back into the Patuxent River, sailing under the Solomons Bridge. The calmer waters made little Naiya happier, and we were able to sail all the way up to Broome’s Island before having to turn around to head home. On the way back, we passed the Tennison, the tour boat for the Calvert Marine Museum. The Museum is a great place for adults and children, and the Tennison gives you a great ride around Solomons and the Patuxent River. This was a really enjoyable day for me, and for the two families who came aboard. They’re coming again in August, and I’m really looking forward to spending more time with them. 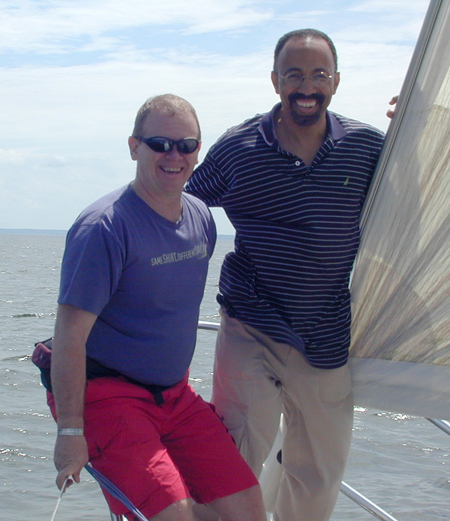 What a great benefit for me, meeting people like this… just from taking a simple afternoon sail on the Chesapeake Bay. I put him to work, helping to get the mainsail up. This is one muscular guy. I understand from his friends that he spends a lot of time at the gym. “Dumbbells,” he said. The perfect form of weight resistance training, forcing each arm to do its own work, improving coordination, balance. Along with Ashwin came friends Mindy, Diana and Carl. They are friends through a social networking group which plans lots of interesting outings and get-togethers, and it was my luck that they chose to go sailing on Heron as one of their adventures. The drinks are on the afterdeck, on Heron… easily accessible during the day. It’s getting warm out there, on these June afternoons, so it’s important to hydrate hydrate hydrate. Carl and Diana met for the first time on this charter, I think. It’s interesting to me when people meet for the first time when they come down to the boat because I’m meeting everyone for the first time. It doesn’t take too long before it seems like we’re all old friends. Mindy is a marketing person for Geico. She’s even worn the gecko costume a few times in the past! She found her spot, and relaxed the day away. She might have even fallen asleep on and off. This is quite common, for folks to find a nice place and drift away for a while. 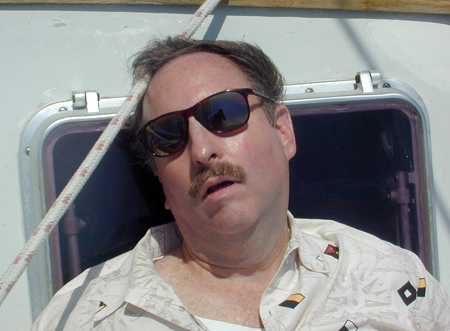 The rocking and rolling of the boat, the breeze, the sounds of the water rushing by… It’s hard NOT to fall asleep! 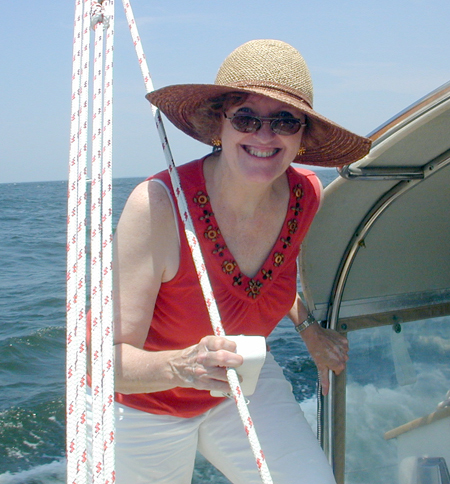 Diana found that sweet spot up on the bow, holding onto the headstay, and enjoyed the view. She is a Lieutenant in the Army, a pediatric nurse currently working at Walter Reed. During the day, as we chatted about all kinds of things, I was impressed by her broad knowledge on so many subjects. A smart lady doing admirable work. And, Behold! Ashwin, the Mighty Hunter, doing his thing. We spotted several aluminum party balloons tied together, floating on the water. These ultimately pop or deflate, and the shiny material is attractive to fish and other marine life, so they eat it… and die. We needed to get these out of the water. Ashwin grabbed the boat pole with its pointy end… I brought the boat alongside… and Ashwin plunged the spear through the heart of those balloons and came away with his prize. And the animals in the Bay were the better off for it. The wind picked up and held up during the afternoon. 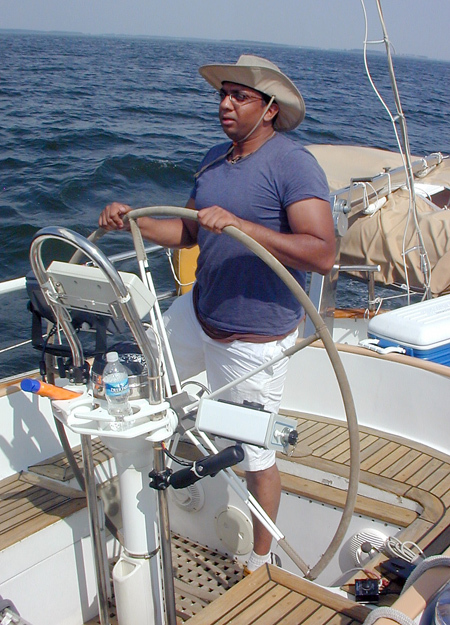 Ashwin spent a lot of time at the helm. Heron is a lot of boat to handle, and he gradually became familiar with her motion through the water and was able to steer a “relatively” straight course. I wonder where the rest of the crew was when I shot this photo. Carl, in July, I believe, is going to run in a race that I had never heard of before. It’s a 24-hour race. You run on an 8-1/2 mile course (this one in Phili near the Schuylkill Parkway) for 24 hours, and see how far you can get. 24 hours straight of running, walking, crawling, limping… Wow, what a challenge. I’m looking forward to hearing how he does on that. I wonder how you train for such a race? 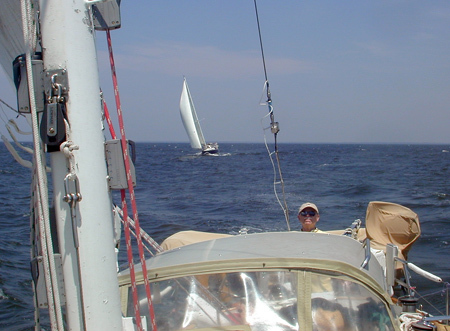 When you’re out on the Chesapeake Bay, there are always other boats around, “traffic,” that you need to be aware of. Heron is bigger than a lot of the boats, but there are plenty of large ships and tugs with barges around that dwarf my little schooner. And, it’s not about size. There are rules-of-the-road to follow, and you need to be constantly aware of who is around, and who has right-of-way. This was a really nice time, with Ashwin and Carl and Mindy and Diana. I appreciated getting to know them and look forward to seeing them all again. Herb and Connie brought their friends Steve and Janice Lynn and Wayne and Linda along for a day sail aboard Schooner Heron on this breezy and sunny Saturday. 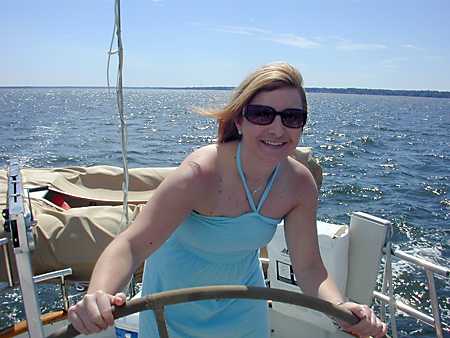 It was blowing pretty well, as we made our way past Solomons Island, out the Pax River and into the Bay. Me thinks Herb has a bit of the pirate in him. 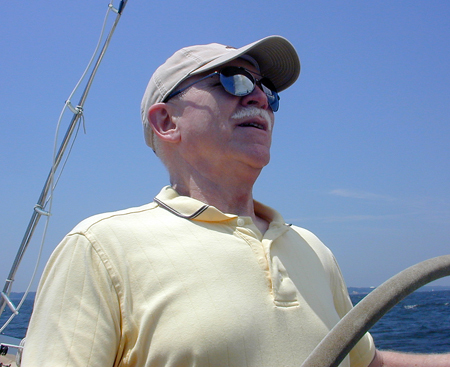 He had that “Show me that horizon,” look in his eyes as Heron took off in the fresh breeze with her full genoa, staysail and main, and he stood the helm for a good part of the day. 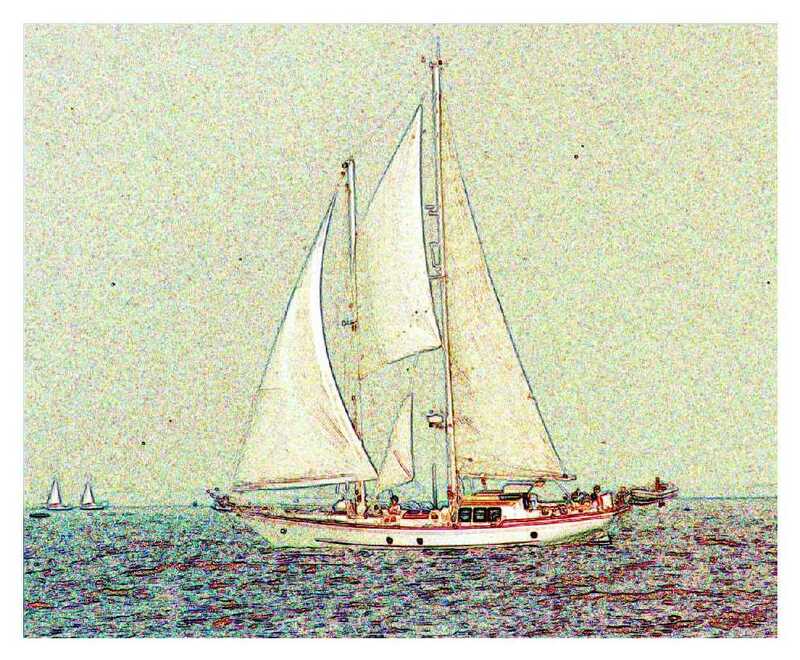 As we sailed along, Connie was finding her sea legs and painted a pretty picture against the backdrop of the Bay. Wayne is an ex-Navy Pilot, and ex-aerobatics instructor… I think he was hoping I’d be able to put Heron through a few barrel rolls or loop-dee-loops. Wasn’t gonna happen. In the cockpit, we were wondering if they make suntan lotion for tongues. When Steve woke, he told us that he was bleaching his teeth, the natural way. Steve found his way forward to that great spot on the bow. He enjoyed it so much, he was up there for about 20 minutes, regardless of the spray that was coming aboard each time we hit a wave. After about an hour of charging south down the Bay in a strong SW wind, we turned around and headed back towards the Pax River… the idea being, that we would sail up River, enjoying the strong breeze but making the boat more comfortable in the calm waters of the River. It was still blowing hard, so when we tacked north, I left the staysail wrapped up to make the boat more comfortable for the crew, and we sailed with full genoa and full main. 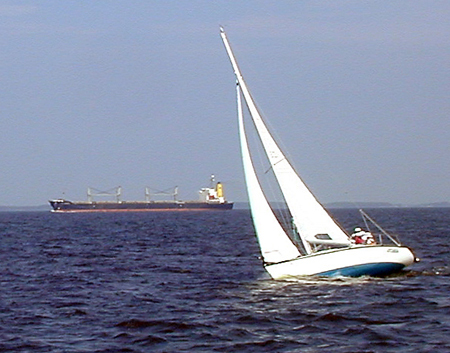 Smaller boats were reefed well down, as the photo above shows. This boat was being well handled with a reefed main, and his genoa rolled in about half way. Other boats were having a good time running full and by, all sails up and out, burying their rails and holding on to their drinks. 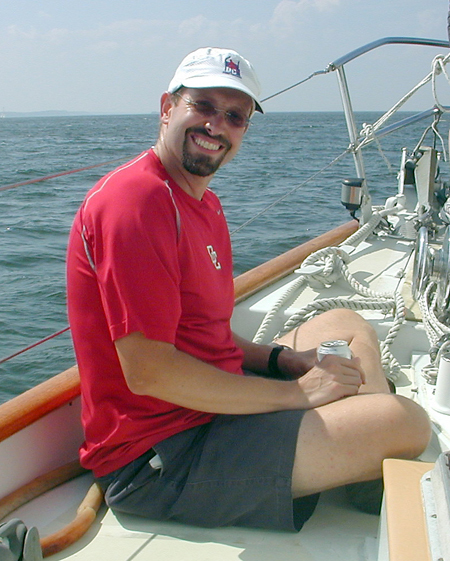 That old sailing adage: One hand for the boat, one hand for the beer! Whenever there are two sailboats, there is a race. 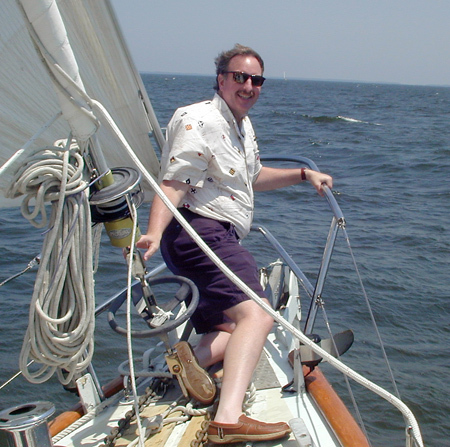 As we were making our way to the mouth of the Patuxent, a handsome sloop was coming up behind, trying to catch us. She was running full and by, and I had my staysail furled, so not only was I underpowered, but the hole in the middle of the sail plan — genoa/nothing/mainsail — was stalling the total airflow and power of the sails. But, Heron held her own, and the sloop was unable to catch us. 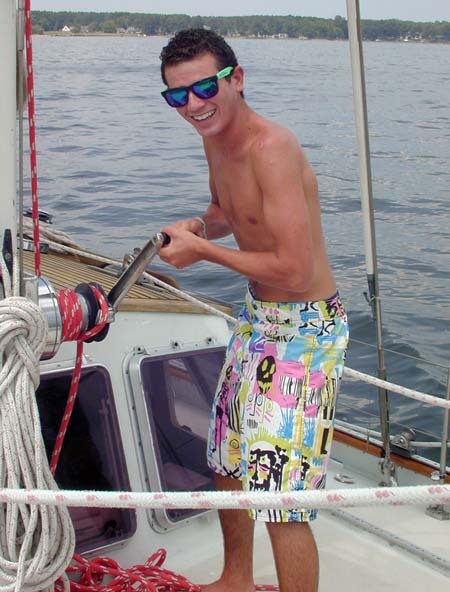 I kept going back and forth, “I should pull out my staysail and blow his doors off,” and “I’ll keep the sail furled, to keep the boat more comfortable for my crew,” and “It’s just my ego at work, wanting to beat the guy,” and “I want the other captain to feel good about himself, creeping up on a larger boat.” In the end, as we got into the calmer waters of the River, I pulled the staysail out because the wind was being somewhat blanketed by the closeness of land. We indeed quickly pulled away from the sloop. This shot shows the broad expanse of deck that Heron has, allowing her guests to lay about comfortably, in sun or shade, depending on which sails are up and which way we’re going. That sloop is still trying to catch us! Here, Connie, Wayne, Linda and Steve are way forward, lounging in these great blue cushions. Available in any marine store, they’re so amazingly comfortable. Adjustable to any angle that you like, your weight provides the stability of the cushion, and the backrest gives you the most wonderful support. 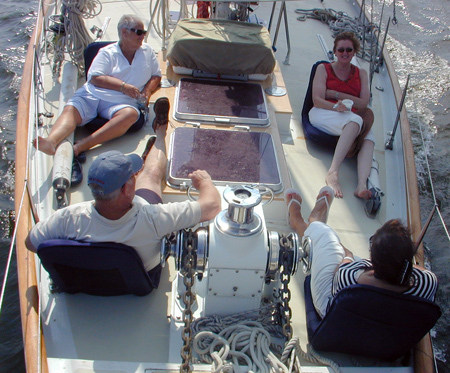 We have six of these aboard Heron and guests take them all over the boat to find a spot to relax and enjoy the sail. Nothing like a monster windlass to provide a good arm rest. As we sailed up River, we saw many folks out on their boats, enjoying the day. In this photo, a boat was pulling a giant banana with six kids hanging on. That looked like a lot of fun. All in all, another nice day. 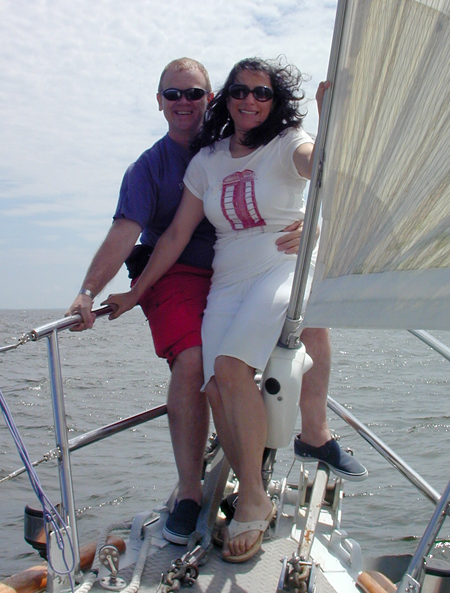 The SSW wind allowed us to improvise and sail up the Patuxent River, to provide a more comfortable ride for the crew. We lounged around, we ate, we had some lively discussions… What more can you ask for? We’ve had some good luck, down here in Southern Maryland, with Schooner Heron Charters. 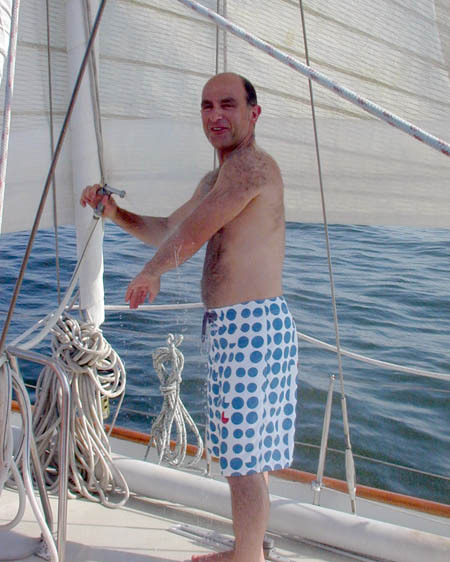 We’ve had lots of wind, lots of sun… and great people coming down for a sailing charters aboard Heron. 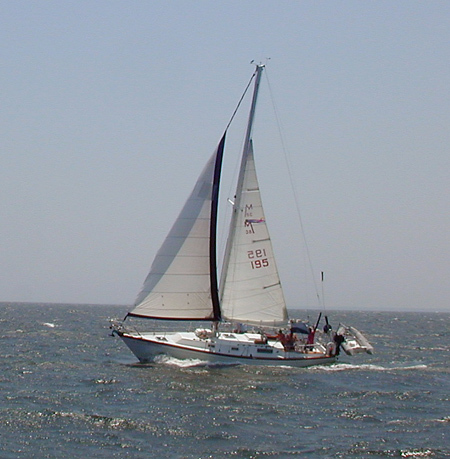 On May 22, we once again had good breezes and bright blue skies on the Chesapeake Bay. 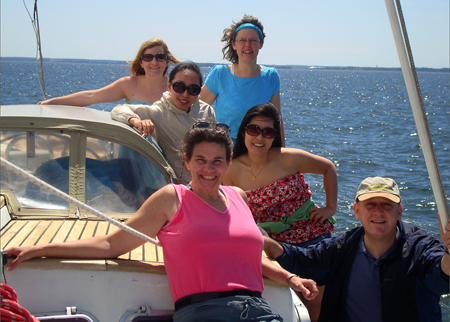 Good friends Oris and Noble brought their wives and sister and friend down for a sail. 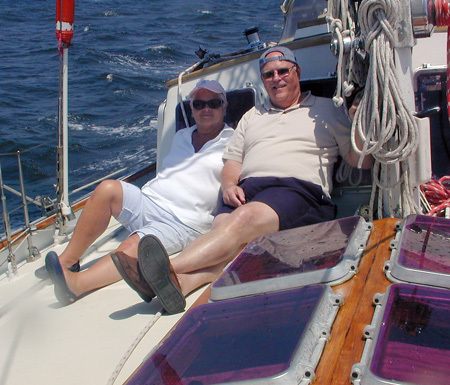 Oris and Noble both are in love with the idea of sailing, with being on the water, and they enjoyed themselves as we talked about boating, sailing “how to’s,” and boat ownership all day. I don’t think either of them had been sailing on a big boat before, yet they were both steering, handling winches under load, and trimming sails like pros. There was a lot of sun, and we were reminded to protect ourselves against too much of a good thing. Covering up and using sunscreen were the rules of the day, but being early in the season, we tend to forget… so a few of us turned a little pink in spots. Damian finally put a hat over his very red forehead. 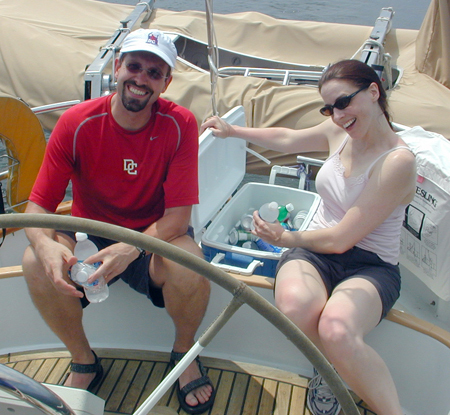 We really did luck out with conditions, and it’s kinda hard not be all smiles when you’re out on a schooner, sailing out of Solomons Island into the Chesapeake Bay, on such a nice day. For me, tremendous pleasure comes from meeting new folks who are enjoying themselves aboard Heron, sharing bits of our lives… where we’ve been, where we’re going… what do we see in our minds’ eyes for our futures… This type of camaraderie, enjoyed while slicing through the waters of the Bay with the wind in our faces… this is what it’s all about. Once again, another really enjoyable day aboard Heron. 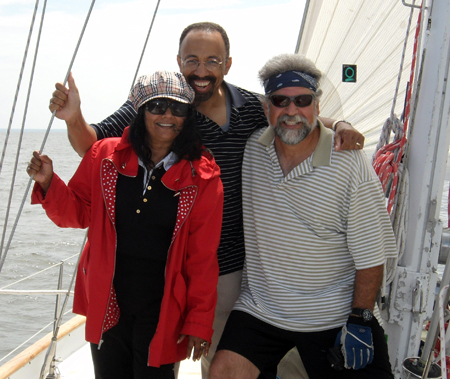 I was truly humbled by the group of folks who came down to Southern Maryland for a daysail charter aboard Schooner Heron. These lawyers (I had to be really careful with my contracts and liability waivers!!!) work in immigration law half the time, at Just Law International, and do pro bono work the other half of the time, working on behalf of the Jubilee Campaign around the world. Ann and Bonnie and Valeria and Sonya and Jiyoon and Tarik, and others who were not on board that day, are doing tremendous humanitarian work — stopping genocide, rewriting laws to protect children, helping refugees, fighting human trafficking, protecting orphans, building homes, working against AIDS… the list goes on… — and I would recommend that people go to their website, learn about their work, and do what you can to support them. Now, back to the charter. AGAIN, a whole lot of wind. But warmer than the last charter. This day, light jackets gave way to t-shirts. And there was plenty of sun. The fixin’s were pretty good. Bonnie did a good job of putting together some snacks. And sandwiches were flying back and forth, faster than we could eat them. 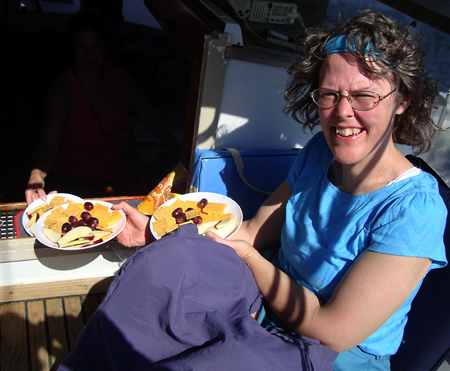 Ann hands out some of the plates of cheese and crackers. We took the time to sail under the Solomons Bridge. Amazing perspective from down below. If you want to stay out of the sun, or wind, the place to be is under the dodger. Tarik found a nice spot and claimed it for his own. Valerie had a great time steering, and held the wheel for quite a good part of the day. 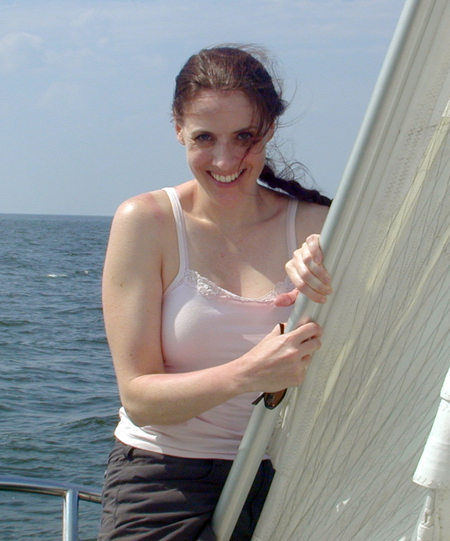 She steered better than some of my friends who have been sailing for years. Some people pick it up fairly easily, feeling the wind, the water… the way the boat responds… Others don’t reach that level of comfort and harmony. 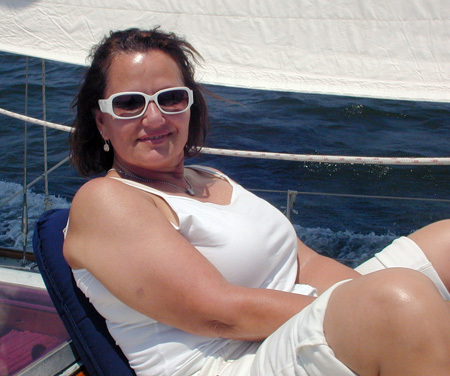 Valerie was definitely in tune with the natural forces that were driving the boat. Being forward on the boat is one of the most exciting places to be. 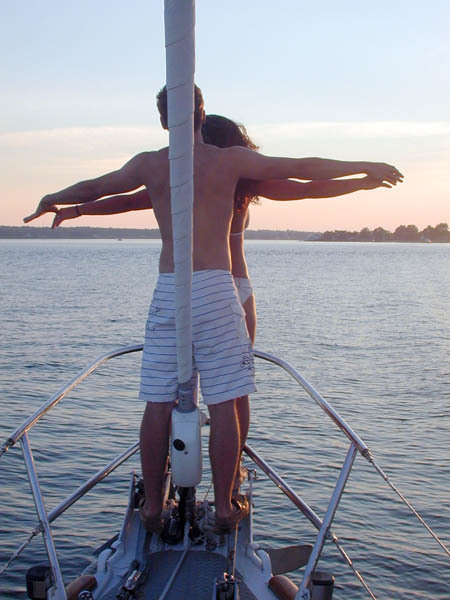 Everyone does the “Titanic” thing, with arms outstretched. You get a tremendous sense of the boat, from the bow, especially looking aft. Instead of being on the boat, looking out, you’re almost off the boat, looking inward. I call it the best seat in the house. This turned out to be a perfect day. Perfect conditions. Wonderful and inspiring conversation. Lots of fun. We all went to dinner afterwards in Solomons Island where I was treated to my meal by the group, an unexpected and appreciated treat. 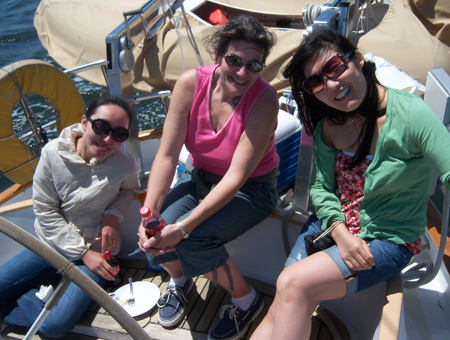 Great sailing, great people… What more can you ask? When you make a recreational visit to Southern Maryland, try to get in a schooner sail aboard Heron, our beautiful 60′ staysail schooner. 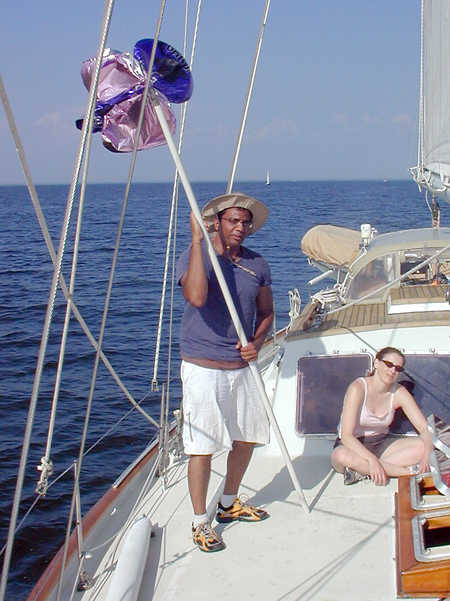 Schooner Heron Charters offers the best deal on the Chesapeake Bay to take a personalized schooner sail out of Solomons Island. 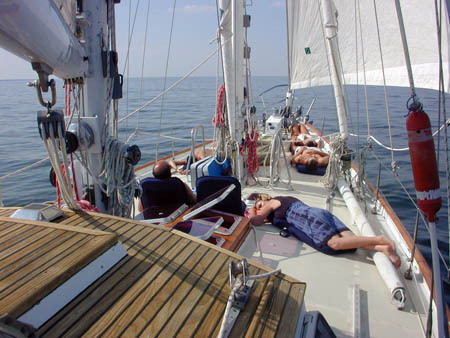 $390 for a 5-hour daysail charter for 6 people, including lunch! There isn’t a better offer like this, anywhere. 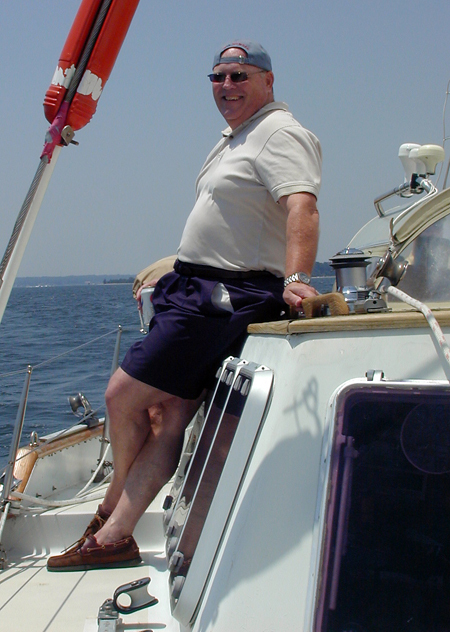 Captain Aram Nersesian will do everything he can to make your personalized sailing charter a wonderful experience and a great day on the Chesapeake Bay. Compliment your sailing experience with bicycling and kayaking. 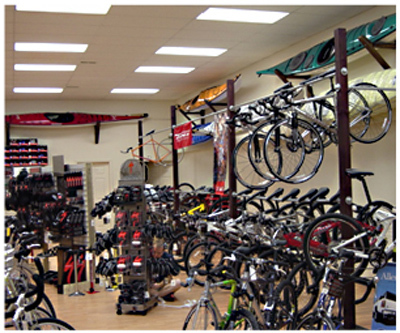 Patuxent Adventure Center has kayak and bicycle rentals, as well as lessons, tune-ups, and full repairs. Open six days a week, closed Mondays, Patuxent Adventure Center is your center for all your outdoor needs when you come down to Calvert County for a day or weekend getaway. May 8th, Patuxent Adventure Center will have a Demo Day at the Solomons Beach on the right side of the main drag going into Solomons Island. Current Designs kayaks will be there in force, and Hurricane and Heritage kayaks will be supports through rentals. Also, Patuxent Adventure Center now carries Tahoe Stand Up Paddleboards, the lastest craze on the water. These great paddleboards are more for flatwater, and provide higher stability and higher speed/track than stand up paddleboards used in ocean waters. 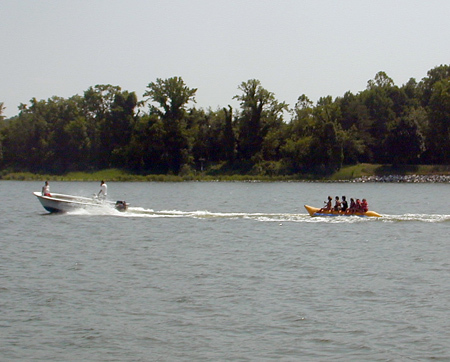 Kayaks are available on the water, every day, ready for a test paddle. Just let them know what kind of kayak you’re interested in trying out, and they’ll arrange to have a few for side-by-side demonstration. This is really the best way to find the kind of kayak you’re looking for. A 1/2 day kayak rental is $35, and that fee is taken off the price of the kayak if you purchase one. Sunday, May 16th, the Patuxent Adventure Center is helping to sponsor the Leonardtown Criterium Bicycle Race put on by the Pax Velo Cycling Club. This is a full day of bicycle racing on the square in downtown Leonardtown. Races go all day and the kids race is always a fun time. 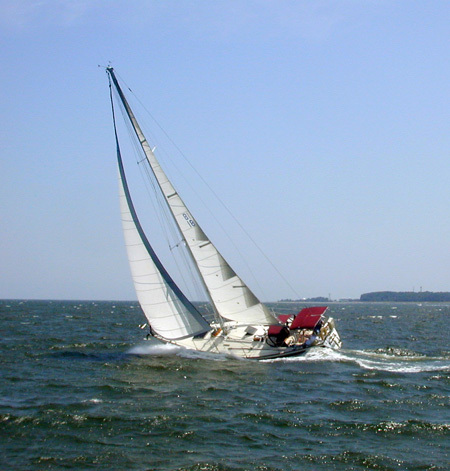 And don’t forget… a visit to Southern Maryland and Solomons Island isn’t really complete without some time out on the water, so plan a day sail aboard Schooner Heron and enjoy the natural beauty of the Chesapeake Bay. 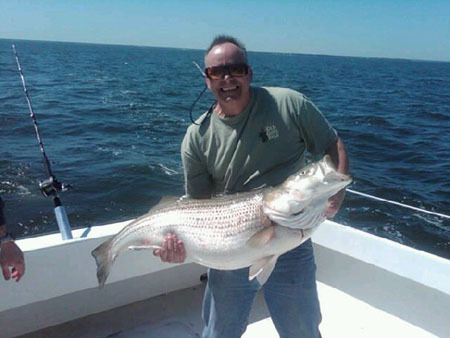 Rockfish season opens in Maryland on April 17, and the big ones are already in the Bay. This 50 pounder was caught during a research fishing trip for the University of Maryland Center for Environmental Science Chesapeake Bay Biological Laboratory on Solomons Island, Maryland. From the looks of things, we’re gonna need BIG boats this year!! !